Now I’ll start out by saying that I really like pancakes. There’s nothing like a little carb-loading in the morning to get me going. Ok, the only place a tall stack of yummy pancakes, drenched with maple syrup and butter gets me going is straight to the couch. Now I might even have to lift a finger to make these tasty breakfast treats, thanks to the latest in robot technology – the pancake flipping robot. 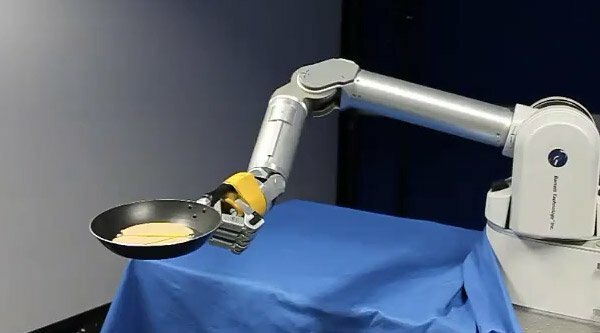 Orchestrated by Dr. Petar Kormushev and Dr. Sylvain Calinon at the Italian Institute of Technology (I didn’t think they even know what pancakes were in Italy), the Barrett WAM 7 DOFs manipulator robot arm, or as I like to call him – “Flippy” – could someday be fixing my flapjacks. At this point, Flippy is just learning the basics of maneuvering the pan and doesn’t know how to work with anything other than a fake pancake, but he means well. As you can see from the video, Flippy is still working out the kinks, but after about 50 attempts to get it right, he’s now able to flip his artificial pancake disc reliably. Now all he needs to do is pour batter into the pan, put it over a flame, and come over to my house for breakfast this weekend.